I have composed my thoughts about the new book, Have Black Lives Ever Mattered? 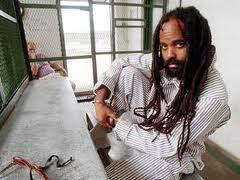 by political prisoner, Mumia Abu-Jamal. Read the piece by clicking through to Down With Tyranny! Abu-Jamal’s collection of essays, published by City Lights Books, covers the extrajudicial killings of Black Americans since the late ’90s to the present. The writings are an attempt to examine how the country arrived at its new stage of intolerance and what can be done from here. As told from the perspective of a writer who has spent the last 30 plus years behind bars, and most of those years on Death Row, the analysis proves to have been prescient in its wisdom and precise in its depiction of the US problem with white supremacy and law enforcement’s impunity when it comes to taking Black lives. I hope you’ll let me know what you think. There is only one voice like Mumia Abu-Jamal’s, its tone perfect for professional broadcasting, and its message carrying necessary information for our times. But Abu-Jamal as most people know, is not an announcer by trade; better known as Mumia to the worldwide community of human rights activists who support his case, the former radio journalist has been serving time in prison for 30 years now. He has spent much of that time writing and appealing his case. In a new film, Long Distance Revolutionary, which made its worldwide premiere over Columbus Day Weekend at the Mill Valley Film Festival, filmmaker Stephen Vittoria and co-producer/Prison Radio sound recordist Noelle Hanrahan, make a compelling case that Mumia’s situation as a prisoner for life is more than a miscarriage of justice: Rather than rehash the circumstances that lead to the incarceration of the journalist/activist forced to moonlight as a cabbie, they shine a light on how he’s used the misfortune as prophetic opportunity, to become a voice for the voiceless. In the film, Angela Davis, Amy Goodman, Alice Walker, Cornel West, Tariq Ali, Ruby Dee and James Cone are among the scholars, theologians, journalists, actors, activists, writers, colleagues, and family members who speak to the important role Mumia, the writer as political prisoner, plays on the world stage, as he reflects the revolutionary’s role in contemporary American society. Through interviews, news reel footage, photographs and most of all, interviews and sound recordings of Abu-Jamal, Long Distance Revolutionary tells the story of an intuitive and self-described “nerd” of a child, Wesley Cook, who journeyed into the Black Panthers, then followed his call to report on his city as he saw it, much to the distaste of its notoriously racist law enforcement. Of course, that’s business as usual in the land of the free; the mystery that unfolds onscreen is more to the point: Just how does a death row inmate as sharp as Mumia keep his mind in shape and his spirit alive while the state does its job squeezing the life out of him? Of particular note are the words of his literary agent Frances Goldin who I’m unable to quote here, but who was sufficiently moved by Mumia’s prose to take a chance on him. Of course the most resounding voice of all is Mumia’s own which can be read in his multiple books in print all over the world; it can also be heard on Prison Radio, still recorded by Noelle Hanrahan. For the Mill Valley premiere, Mumia delivered an address, especially recorded for the Bay Area which he remembered from visiting once as having a “luscious sun,” where he, “a tall, skinny, dark sunflower,” could be among some of the “best, boldest, blackest, sweetest” brothers and sisters he claims to have known. Curiously, the film’s only musical voice was M-1 of Dead Prez; traditionally, it is musicians who sing out for injustice, in the way that Bob Dylan once did for Rubin “Hurricane” Carter (who also appears in the film), indirectly leading to his exoneration. Eddie Vedder’s recording of “Society” (previously associated with the feature film, Into the Wild, concerning environmentalist/adventurer, Christopher McCandless), serves as a closing theme. So where are the other contemporary Musicians for Mumia? According to director Vittoria, the usual suspects were approached, but only Vedder responded to the urgency of the call. Abu-Jamal was taken off death row late last year; he remains sentenced for life without possibility of parole and lives among the general prison population at the Pennsylvania State Correctional Institution at Mahanoy. But the system has not vanquished his spirit or his message. Mumia is on move: Long Distance Revolutionary is on its way to festivals in Denver, Copenhagen and New York City. It opens in wider release in February of 2013. Here’s the trailer.